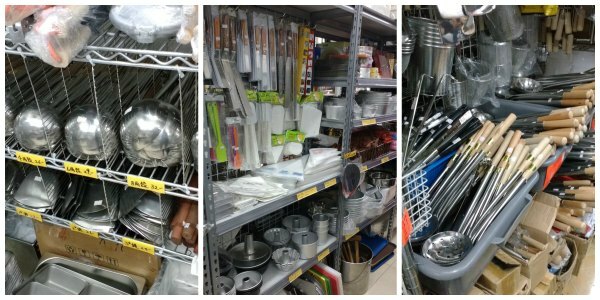 Where to buy kitchen supplies, kitchen utensils, baking supplies, small appliances for kitchen in Hong Kong? Basically all things Kitchen! The ANSWER is Shanghai Street in Kowloon area. 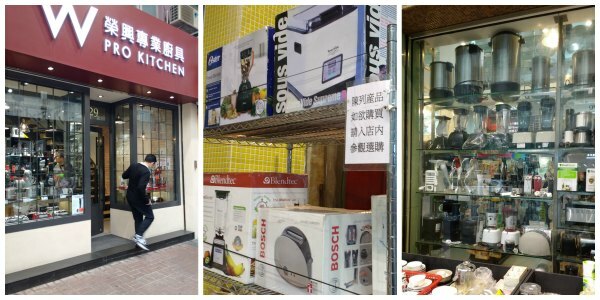 If you are looking for all things kitchen at reasonable prices, head straight to Shanghai Street. 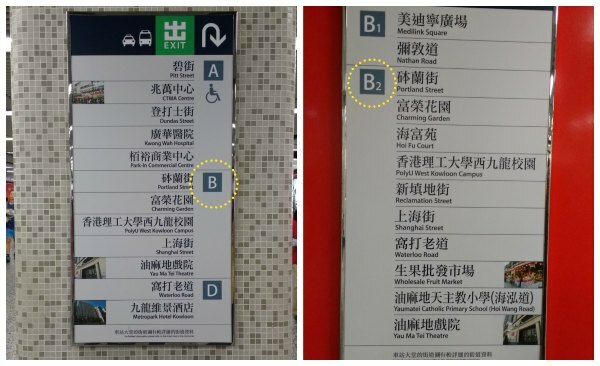 You need to take the MTR to Yau Ma Tei station in Kowloon. Its a couple of stops after Tsim Sha Tsui (TST). Once you land in Yau Ma Tei, then take exit B that goes to Portland Street. You will exit the MTR to hit Portland Street. Cross Portland street across and keep walking to come to Shanghai Street. 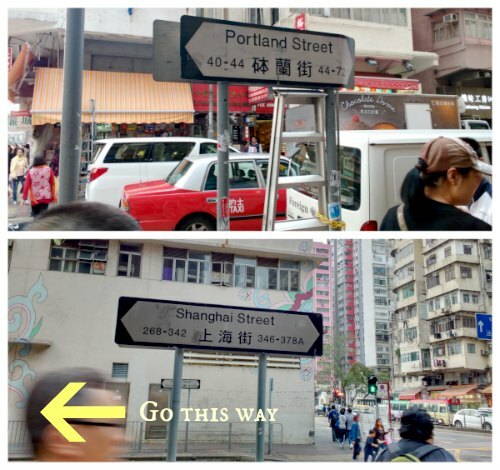 Shanghai street is parallel to Portland street. The shops should start right away after walking for about 3-4 minutes. If it doesn’t, you are going in the opposite direction. You will find bargain priced quality kitchen supplies at this place. Shanghai Street has overflowing kitchen shops that serves the requirements of both restaurants and home cooks. 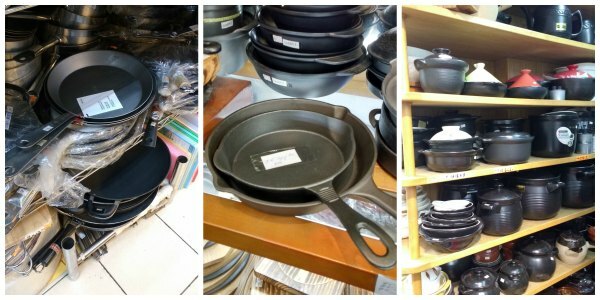 You will find store after store filled with pots and pans, cleavers, regular knives, chopping boards, baking supplies, small appliances like blenders, rice cookers, and a super wide range of ceramic-ware. You will find industrial range of kitchen supplies too. If you love cooking, then its a delight to visit Shanghai Street. You will find repetitive items in some shops but that’s ok. Check for the prices in shops and pick the one that gives at the cheapest price. Wall mounted stainless steel racks to toothpicks, you will be delighted with so much choice on offer. 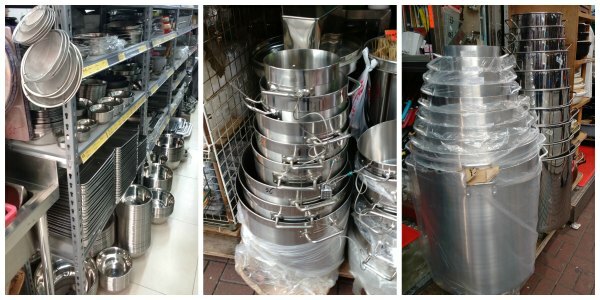 In India, we are so used to using stainless steel bowls for mixing, cooking etc… You will find them all here. I was surprised to find stainless steel plates and cups too! They even have pressure cookers. 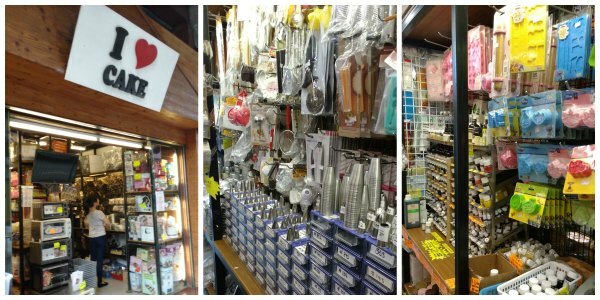 This store is well stocked with all kind of western kitchenware, small appliances and gadgets. They had all sorts of small appliances popular in western countries like kitchen-aid stand mixers, juicers, coffee makers, blenders, bread makers, handheld mixers etc.. The nearby stores even had sous-vide cooking equipment’s and heavy duty blenders of all sizes. They have been in business for more than 50 years. I was in awe to see the chopping boards that were carved out of a single piece of wood. Those giant wooden chopping boards that look like ottomans are a delight to watch. Do not miss this store. 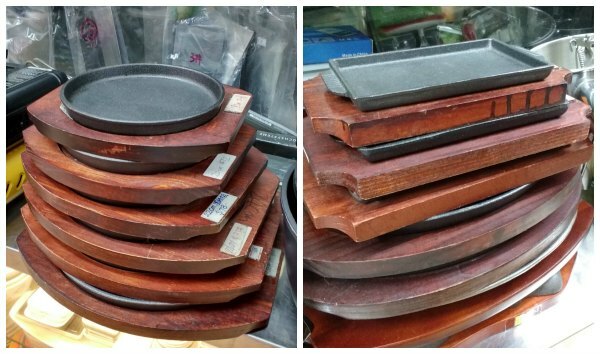 They also sell all sizes of regular chopping boards, Japanese sushi making tools made of wood, cute little wooden spoons and all kinds of kitchen utensils. You will also be able to find some traditional moon cake molds here. I first knew about Shanghai street after watching an Anthony Bourdain layover episode. He visits Chan Chi Kee knife shop on the show. The giant cleavers and the whole shop filled with knives that they show on the episode will make you want to visit Shanghai Street. You can watch the show here. (They show Shanghai street around the 18th minute onwards) Cleavers, cleavers and cleavers wherever you turn. Wooden handles, metal handles, so sharp and so many varieties. I have found that even the cheap $50 HKD knives to be incredibly sharp. I bought one to test how long it stays sharp. I have had it for more than three weeks now and it is still very sharp just like day one even after 3 weeks of extensive chopping. They are worth it. Look for knives that are made in Japan. 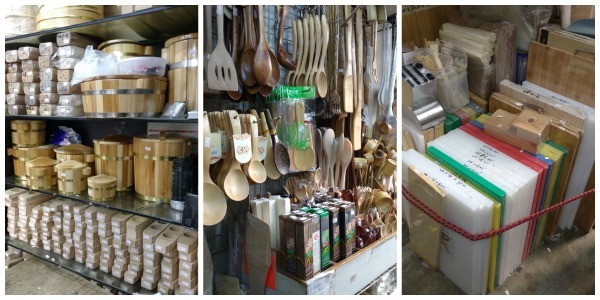 Shanghai street is also a baking supplies galore. If you love baking, then you are a kid in a candy store. 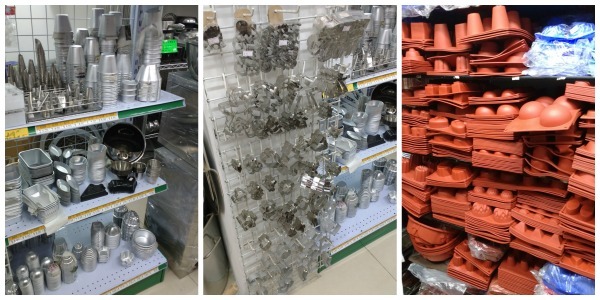 Tools, cutters, silicone moulds, cookie sheets, cake pans, baking ingredients…. You will find them all here. If you love baking, then you will get all the things you need here. From baking pans, cookie sheets, bundt pans, moulds, cookie cutters to cup cake wrappers, ramekins, food gel colours, nozzles, tart pans, metal icing tips, parchment etc… you will even find baking ingredients here. You will pick up way more than you need if you like baking!!!! 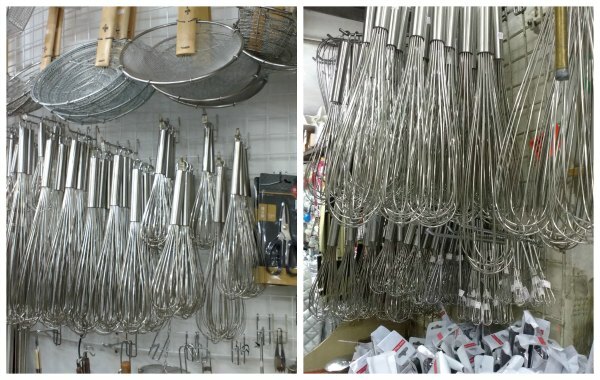 It was an over populated whisk world across the shops in Shanghai street! 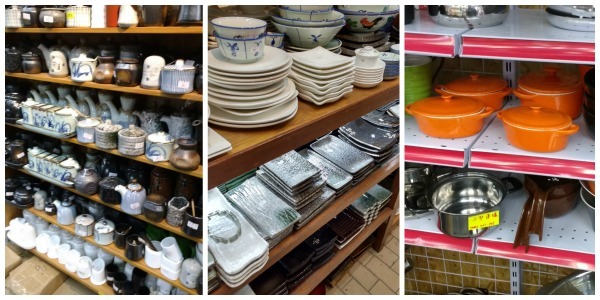 Lots of shops on the lane are well stocked with ceramic-ware. From plates to cups, teapots to sleek serveware. They have it all. 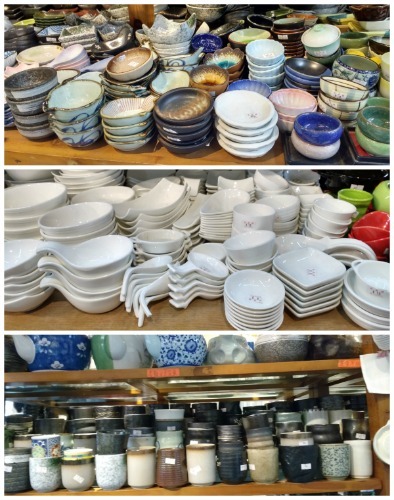 The japanese ceramic-wares, teapots and saucers, soup bowls in shanghai street stores are all so elegant and cute. I also came across super heavy mortar and pestles carved out of granite which looked too good to pass. Then the Le Creuset style enameled cast iron pots were there too! 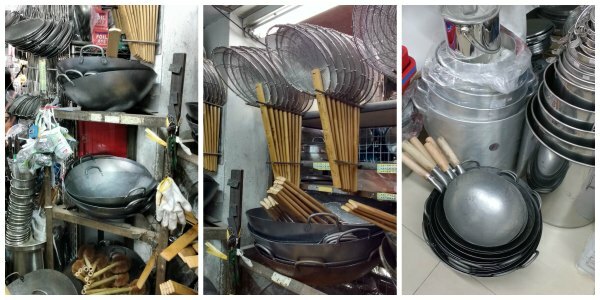 The iron pans, woks, whisks, spatulas you will get everything here. 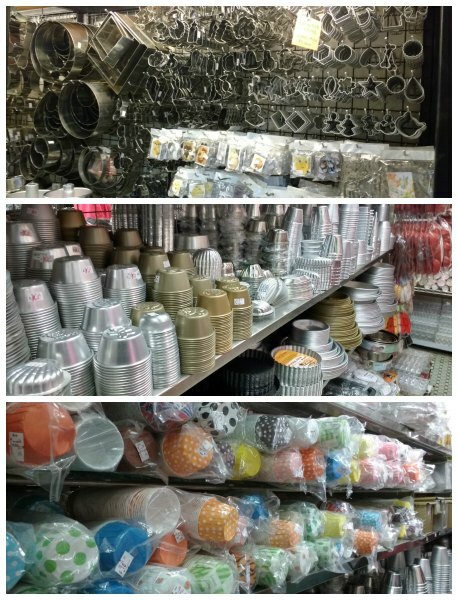 Its a kitchen supply stores heaven. Then, then, then I came across this knife store. I spent close to about couple of hours in the knife section. The Japanase hand crafted knives were so good. The price range starts from $1000 HKD upwards. The layers of steel was so so visible that one realises how much labour, man hours and craftsmanship would have gone into making these knives. Labor of knife love. Plus, they have good stock of all popular knives. They had a full range of my favorite Wusthof knives. I have been eyeing on buying a nakiri vegetable knife for a long time and they had it. And came the dim sum steamers!!!!!!!!! You would find bamboo steamers for very reasonable prices. Single bamboo dim sum steamers were so cute. And these! Sizzlers seems to be so popular here! The streets seemed endless. Be prepared to carry a lot of stuff. Come with big shopping bags. Have fun and shop to your hearts desire in this wonderful kitchen heaven! Do you happen to have the details Wusthof shop? 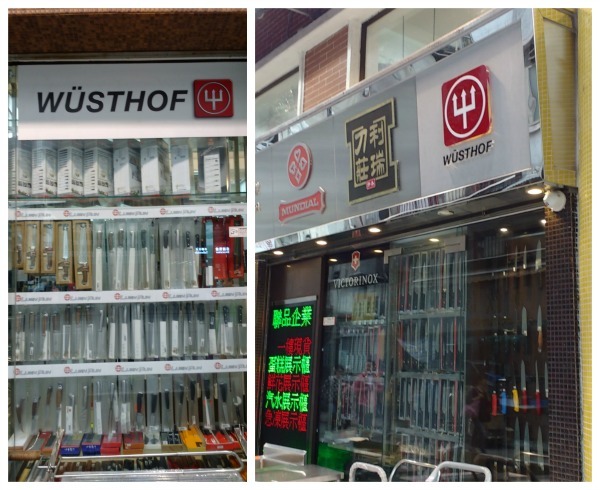 Hi Dave, There is a shop just next to W Pro Kitchen in Shanghai street that sells Wusthof knives and Japanese knives. They have a great selection. They have a big board that says wusthof. Sorry, I do not remember the name of the shop. find a lot of high grade Japan kitchen knives that came from Seki, Sakai and Higo Japan. Powder steel,cobalt steel and Mo steel knives are available ,as well as Japan grinding water stones. The shop is near Boering street Jordan MTR station C2 exit,walking about 2 minutes from the C2 Exit. Nice post. I am visiting HK in about 3 weeks time. I am sure going to visit Shanghai street. I love baking and I am in the midst of setting up our new house, so I’m very excited. Wanted to ask you, if there are any other places of interest to visit, other than Disney Land. I have a 5 year old kid coming with us. I have many of your recipes and commented each time when i try them. Thank you so much and God bless you. Thank you!! Thank you Asha. It would depend on what kind of places you want to visit. You can do some easy trekking, endless shopping and food in mongkok, there are a lot of museums, big buddha etc…It really depends. There is an ocean park too! Also Macau! Just check for things to do in HK and google will give you a fair idea. Thats so nice Carine. Its really brave of you to move from Europe to visit places. So cool. Hope you are liking Gods own country. Thank you so much. Your comment really means a lot to me. 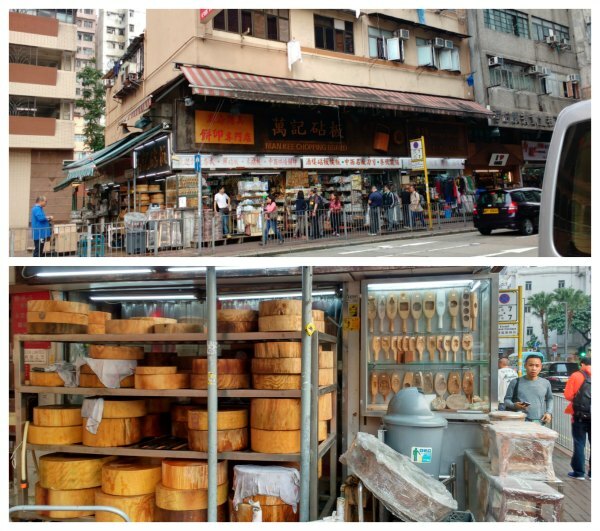 It’s a shame HK was never in my travel bucket list,.. until I stumble upon your blog! I am now a convert and would love, love to visit this Shanghai Street, especially the knives heaven, thanks to your storytelling and photographs. BTW I’ve been eyeing to try your Paal Appam recipe this weekend. Need some kitchen wisdom. Lots of we’ll wishes from Malaysia! ? Wow.nice nice. I like to see your recipe in this site. I am a exporter of chettinadu snacks.please don’t hesitate to contact me when you need it. Missed your posts all these days. That was a nice tour of Shanghai Street. We could literally visualize the kitchen supplies in your words… Looking forward to a dimsum recipe soon.. Loved the tour of Shanghai St! Looking forward to your culinary adventures in Hong Kong. Sorry I meant Hong Kong ? We bought a wok, an iron pan, a couple of knives and some pots!